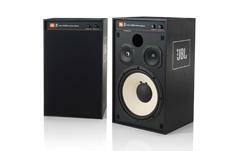 In honor of its 70th anniversary, JBL has introduced the 4312SE three-way studio monitor. The company calls it a direct descendant of the classic 4310/4311 monitors, and it sports a three-way design with a 12-inch pulp cone woofer, five-inch pulp cone midrange driver, and one-inch aluminum/magnesium alloy tweeter in a front-ported bass-reflex enclosure. The 4312SE can be positioned horizontally or vertically, and it comes a special 70th anniversary badge. Pricing and availability have not yet been announced. JBL has introduced the 4312SE high-performance, three-way studio monitor loudspeaker developed in honor of the 70th Anniversary of the JBL brand. As a direct descendant of the legendary JBL 4310/4311 family of monitors, the 4312SE maintains the iconic 12-inch (300mm) three-way design that set the standard for recording monitors in the 1970s. In that classic fashion, the 4312SE delivers crisp, powerful bass along with realistic and dynamic highs, even at the highest listening levels. Designed and engineered in Northridge, California, the 4312SE loudspeakers are built in matched mirror-image pairs allowing for a wide variety of placement and positioning applications. In classic studio monitor fashion, they can be positioned horizontally or vertically and with the tweeters to the inside or outside of the listening position, and they can be shelf- or stand-mounted. This flexibility makes them capable of serving equal duty in small, intimate listening environments or in larger rooms without sacrificing the detail and coherent stereo soundstage and image quality that studio monitors must have. "For more than 70 years, JBL has provided professional quality audio equipment for concert halls, theaters, and recording studios around the world and has become the trusted choice of artists and sound engineers," said Jim Garrett, Director of Marketing and Product Management, HARMAN. "The 4312SE honors that legacy with an iconic configuration that dates back to 1968, all while incorporating the best of today's modern component technology and acoustical design." Utilizing a compact monitor-type footprint, the 4312SE features advanced JBL transducers including the 12-inch (300mm) 1200FE-8 Aqua-Plas-coated Pure Pulp cone woofer, the 5-inch (125mm) 105H-1 Polymer-coated Pure Pulp cone midrange, and the 1-inch (25mm) 054ALMg-1 Aluminum/Magnesium Alloy tweeter with waveguide. Special 70th Anniversary badges are affixed to each of the loudspeakers, and a 70th Anniversary certificate is included with the serial numbers of the individual loudspeakers and signatures of the system engineer and factory assembly technician. Front-panel mid- and high-frequency trim controls, bass-reflex enclosure with front-firing port, binding-post speaker terminals, and a black wood grain finish with removable black cloth grille round out the system's performance features. "Following in the footsteps of the storied JBL anniversary monitors like the 4312 MkII and Century Gold, the 4312SE is sure to become a legend in their own right among JBL fans," said Garrett. • Samsung Will Acquire HARMAN International at HomeTheaterReview.com. • New JBL 4367 Speaker Brings Professional-Grade Audio Performance to the Home at HomeTheaterReview.com.